I recently came across yet another project of Stewart Brand’s which I find worthy of mention. I’ve been a fan of Brand’s since he was kind enough to publish my first letter-to-the-editor contribution back in 1976, when I was a teenager eager to go into space. It seems one of his many projects with a forward gaze is the Revive and Restore initiative to bring extinct species back to life, starting with the passenger pigeon. There are so many different aspects of this project worthy of discussion, from the ethics of ‘de-extinction’ to the hope it might offer for current species under pressure (quite literally, too many to name). This is not some warm-blooded version of Jurassic Park. So I raise my Sunday champagne glass, again, to Mr. Brand – thank you for this most recent addition to a lifetime of interesting discussions and projects. There will be a TEDx discussion on DeExtinction on 15 March 2013 – check the Revive and Restore website for details. 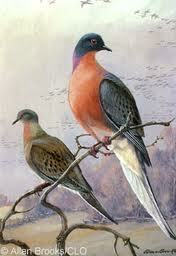 “The Passenger Pigeon or Wild Pigeon (Ectopistes migratorius) is an extinct North American bird. The species lived in enormous migratory flocks until the early 20th century, when hunting and habitat destruction led to its demise. One flock in 1866 in southern Ontario was described as being 1 mi (1.5 km) wide and 300 mi (500 km) long, took 14 hours to pass, and held in excess of 3.5 billion birds. That number, if accurate, would likely represent a large fraction of the entire population at the time. Another informative article on the pigeon and the flux of animal populations in relation to human impact can be found here. Hi – Thanks for your comment, fellow Brand fan! Stewart Brand is really an inspiration and an excellent reminder of what was actually good about the idealism of the 60s. We used to look forward to that and the co-Evolution Quarterly.